Here you may find the answer to some Frequently Asked Questions. Of course, you can always Contact us directly. If I return earlier than planned from a canoe tour, will I get any money back? No, however, you are welcome to keep the canoe/kayak for the remaining days you’ve paid for. Do I need to pay anything in advance when making a reservation for a canoe tour? Yes, the transport cost is always paid in advance. When we have received your advance payment your reservation is confirmed. The rest is paid upon arrival. You can either pay by invoice or via Payer. Do I have to make a reservation if I want to make a day tour? No, for day tours we have drop-in anytime between the receptions’ opening hours. Is it possible to drive myself out to my starting point? How many seats does your cars have? We have 8 seats in each car, driver seat excluded. How many waterproof barrels fit in one canoe? You can have a maximum of 4 barrels in one canoe. Can you sit 3 people in one canoe? In general we do not recommend to sit three in one canoe. The exception is if you have a small child with you but we would never recommend three adults to sit three in one canoe. If you after all want to sit three we have a few that have three seats but these are only used for day tours. Do you have double-kayaks for rent? No we only have single-kayaks. At what time does the transfer leave for our starting point? We meet at the reception at 9 am to sign the rental contract and start loading the car. Can you give us transfer with our own gear? If you have your own canoe and only want to pay for transfer the price will be the same as our normal transfer prices (see: Canoe prices) but with an added fee of 50% of the original price. Contact us for more information. Is it necessary to bring a canoe trolley on the tour? Yes, we recommend to always bring a trolley so that you can easily transport the canoe on land. This is a must if you are paddling Hårkan since there are several power stations which you cannot paddle through. You also don’t have to empty the canoe when transporting it with a trolley. Is it necessary to pack in packing barrels? Yes, we strongly recommend packing barrels. They are extremely water-safe and very durable so the risk of them breaking is minimal. Also, if they end up in the water they will float. Packing bags are much less durable than barrels. How many canoes can you transport at once? We can transport a maximum of 10 canoes per car, canoe trailer included. Is it possible to share transfer with another group to get a cheaper price? No this is not possible due to two major things. First of all, included in the transfer price is all the service around your tour, such as maps and instructions. Secondly, we never want to drop off two separate groups on the same starting point. This is because we want our customers to be able to experience the wilderness without it feeling crowded on the water. Therefore, it is not cheaper to share a car with another group. How long in advance should I book my canoe tour? If you are interested in a tour in July/August you should book your tour at least 3-4 months in advance. If you have a certain date in mind and is not very flexible you might have to book even 5-6 months in advance. We have a limited amount of cars and drivers and since some dates are more popular we cannot guarantee that you get the date you want if. How difficult is it to paddle a canoe? To paddle a canoe is not difficult at all and if you want we will gladly show you some of the basics before letting you out on the water. You are very welcome to come by at any time our reception is open and we will help you get started! When is it possible to paddle in Jämtland? It differs from year to year, but usually from the middle of May depending on weather and wind, and how early the ice melts. In the autumn you are usually able to paddle until the end of October. If you don’t mind cold nights, autumn in Jämtland is a beautiful time to experience the northern wilderness! What types of canoes and kayaks do you rent out? Do you need fishing license in Hårkan? Yes, you do. In our reception we sell fishing licences for both around Lit and for almost the whole Hårkan tour. If you are doing the 150 km tour you will have to get a separate license for Norway. We can make a stop on the way up if you want to buy one. What kinds of fish are there in Hårkan? Are there any rules around fishing in Hårkan? Yes, and it is important to stay updated about current rules, for example if there is a ban on fishing in a certain lake or of certain kinds of fish. You can always ask us what applies before heading out. Are there any dangerous animals in the forest? The most common animals here are moose, reindeer, deer, fox and beaver. Occasionally there are brown bears in the forest but they are rare and very shy towards people. You should always show respect toward the animals and never try to intimidate or scare them, you could end up in a dangerous situation. But in general they are not dangerous. Are there a lot of mosquitos in the forest? Yes, a normal summer it can be a lot of mosquitos so we recommend to bring mosquito repellent. Can you drink the water in Hårkan? During the spring we strongly discourage you to drink the water in Hårkan because of the spring flood that collects all the dirt from the sides along with it. However, during the summer you can drink the water as long as you are aware of where you take the water from. For example don’t fill up your water bottle where the water isn’t moving! Do you offer coached canoe tours? No we don’t. However, we collaborate with several canoe coaches, for example, Matt Larsson-Clifford who runs Sweden Outdoors Coaching among other. What are your terms and conditions for cancellations? Up until a week before your transfer date it costs 250 SEK in cancellation fee, the money you’ve paid in advance you will get back. If it’s less than a week before we cannot offer you any money back that you’ve already paid. Are maps included in my canoe tour? Yes maps are included in the price and we will go through them with you before heading out. Is it possible to re-supply along the tour? By 110 km and 60 km it’s possible to reach nearby villages where you can re-supply. We will show you on the map before we drop you off how to get there if needed. How are the water levels in Hårkan? In general the water levels in Hårkan are good since it’s controlled by all the power stations. If the water levels should be so low so it may lead to problems for you we will contact you in advance to let you know. Are there water in the cabins? In all our self-catering cabins there are water. However, our timber- and camping cabins are lacking water. There are water cans in every cabin so you can get water from the service building. What amenities are there in the cabins? Yes, all our cabins are insulated and there are radiators in every cabin where you can adjust the heat. Are there mosquito-screens in the cabins? Yes, there are mosquito-screens in all cabins. Is it possible to park outside the cabins? Yes, every self-catering cabin has its own parking space and outside the timber- and camping cabins you can park as long as you don’t block the road or anyone/anything. What are your terms and conditions of cancellation? Up until a week before check-in it is free to cancel your reservation. With less than a week left we will charge 250 SEK in cancellation fee and if you cancel last minute, meaning that you cancel after 12:00 AM the day before check-in we will charge the first night in cancellation fee. Dogs are allowed in all cabins. However, other pets are not allowed, cats included. Are there TV in the cabins? Yes, in all self-catering cabins there is TV. However, in the timber- and camping cabins there are no TV, but we do have a TV in the common kitchen. You can pay with cash, card or Swish. We accept euro and norwegian crowns, however, we do not offer a correct exchange rate. The self-catering cabins are open all year round, however, the campsite opens on the 1st of May. If I arrive late and the reception is closed, what do I do? Contact us via the video device on the side of the reception’s door or call us if you are looking for a cabin. If you want to stay with your caravan/camper/tent just go ahead and find a spot and then come in the next morning to pay. Our opening hours in the reception varies, but during peak season we are usually open from 08:00 am to 22:00 pm. 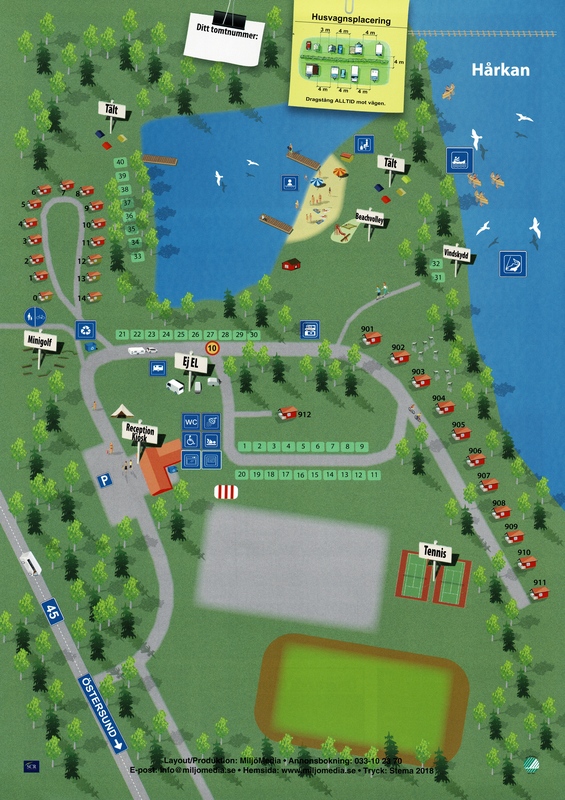 For cabins check-out is at 12.00 am and for caravans/campers it is 15.00 pm! I don’t want to clean my cabin before leaving, do you offer cleaning service? Yes, we do offer cleaning service. However, it does not include washing dishes or throwing away the trash, that is up to you! We have to leave before the reception has opened, where do we leave the key? You can drop it in the white mailbox next to the reception door. How do we get to the campsite from Åre/Östersund Airport? From the airport you can either take the shuttle bus to Östersund and then from there take another bus to Lit. Tickets are about 60 SEK and the bus stop in Lit is called “Viadukten” and it situated about 300 meters from the campsite. You can also take a taxi. That will cost around 800 SEK, but keep in mind the price might vary. We do not have any pick-up service unfortunately. Do you offer bicycles for rent? Yes, but most of them are for children who can borrow them for free. We only a few for adults and there is no booking system for the bikes. Is it possible to rent the Tentipi for events? Yes, it is possible! Contact us for more information and a cost estimate. Is it possible to rent the sauna even if we are not guests of yours? Yes, it is possible! To rent the sauna it costs 50 SEK per person, however the minimum is a 150 SEK to rent it. Firewood you either bring yourselves or buy in the reception. Contact us to make a reservation!